2. From the Online Etymology Dictionary: c.1384, from L.L. galaxias "Milky Way," from Gk. galaxis (adj. ), from gala (gen. galaktos) "milk". The technical astronomical sense emerged 1848. Fig. sense of "brilliant assembly of persons" is from 1590. 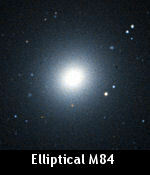 An Elliptical Galaxy Called "Peculiar"
A Sub-type of Galaxy that's generally assigned the designator "Pec" or "P." Peculiar  distinct from all others, unusal or strange. 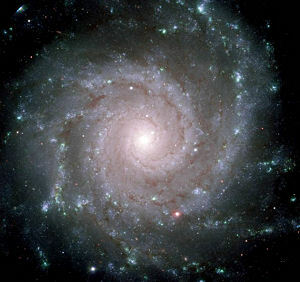 » Solar Mass - in astronomy it is used to describe the masses of other stars and galaxies. It is equal to the mass of the Sun, 332,950 times the mass of the Earth, or 1048 times the mass of Jupiter. The solar mass can be determined from the length of the year, the distance of the Earth to the Sun (the astronomical unit - AU), and the gravitational constant G.
» Angular Size - the sizes of objects in the sky are often given in terms of their angular diameter as seen from Earth, rather than their actual sizes. The angular diameter of Earth's orbit around the Sun, from a distance of one parsec, is 2" ( two arcseconds ) see Wikipedia. » Radial Velocity / Redshift - is the velocity of an object in the direction of the line of sight ( i.e. its speed straight towards you, or away from you ). Radial Velocity & Redshift are "hand-in-hand" data; the light of an object with a substantial radial velocity will be subject to the Doppler effect, so the frequency of the light decreases for receding objects or redshifted and increases for approaching objects or blueshifted. The radial velocity of a star or other luminous but distant objects can be measured accurately by taking a high-resolution spectrum and comparing the measured wavelengths of known spectral lines to wavelengths from laboratory measurements. By convention, a positive radial velocity indicates the object is receding; if the sign is negative, then the object is approaching. » Accretion is the physical process of matter being pulled from a source or stellar object into another point or object via a large gravitional field of attraction. This process is associated with, amongst others, black holes, regions of star birth and some processes of galaxy formation. In terms of galaxies and accretion see the recent study: Ongoing Galactic Accretion: Simulations and Observations of Condensed Gas in Hot Halos the Astronomical Journal, J. E. G. Peek et al 2008 ApJ 674 227-236. » Tidal Arm As galaxies merge, small galaxies or stars may be born in the dust and gaseous debris thrown out from the collision which can often form an extension much like the arm of a galaxy. Tidal arms and debris are seen in our own stellar system as the Milky Way and two nearby galaxies, the Large and Small Magellanic Clouds continue their gravitational "tug-of-war" with each other. » LEDA refers to the Lyon-Meudon Extragalactic Database The Smithsonian/NASA Astrophysics Data System LEDA was created in 1983 at the Observatoire de Lyon. 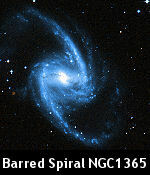 » LINER type Active Galaxy Nucleus refers to a Low-Ionization Nuclear Emission-line Region for a type of active galaxy. "LINERs are characterized by extremely bright, starlike central nuclei...and are low-luminosity cousins of Seyfert galaxies. While normal ( spiral ) galaxies radiate primarily at optical and infrared wavelengths, active galaxies tend to have significant x-ray and synchrotron radio emission. The source of x-rays is likely to be an active galactic nucleus ( AGN )." see Multiwavelength Astronomy at the Cool Cosmos website. This site also offers some very nice classroom based labs and experiements -- highly recommended. » Seyfert 2 Galaxy is a class of galaxies with nuclei that produce spectral line emission from highly ionized gas. Please note that this list is by no means exhaustive and neither is it intended to be. 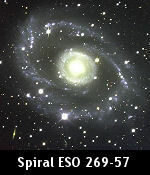 There are many fine astronomy websites that are dedicated to astronomical terms and defintions: Encyclopedia of Astronomy and Astrophysics from Nature Publishing Group and Institute of Physics Publishing  The Internet Encyclopedia of Science from astronomer/author David Darling  Wikipedia the free worldwide user contributed referencec source. The above terms are those that the reader will encounter throughout this section and therefore, should be familiar with. 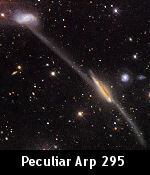 But what about those galaxies we classify as "peculiar" or "polar ring" or "irregular"? Of course, there is a lot of scientific ground that lies in between the above examples but we'll keep it simple for now and discuss the various sub-types as we progress through each category. 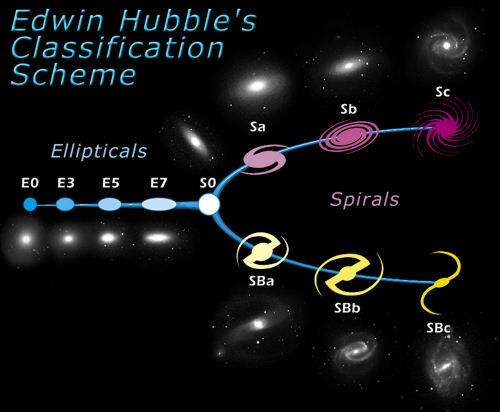 For those wishing a more thorough review of galaxy classification there are links on the last page of this section that detail Hubble's system in much greater depth ( go to the "bibliography section ). When we think of galaxies we usually picture something similar to the above images of Spiral galaxies M74 and M81, also known as NGC 628 & NGC 3031 respectively ( Images: M74: The Perfect Spiral Gemini Observatory, GMOS Team and Galaxy Wars: M81 versus M82 M81 by Rainer Zmaritsch & Alexander Gross ). However, galaxies come in many different shapes and sizes, from Unbarred Spiral to Irregular, Dwarf galaxies that contain only several billion stars, our milkyway contains 200-400 billion, to Giant Galaxies like M87. As discussed earlier, when we use the term morphological we are talking about the visual shape of a galaxy. The images below are an example of the various morphological types. Astronomical data on each of the above galaxy can be displayed below by clicking this link here. 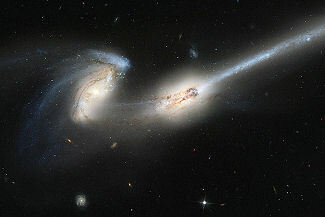 Redshift and Blueshift, Colliding and Interacting Galaxies, Milkway and Andromeda, Hubble's Law and Computer Simulations, Compact Groups and Black Holes, Tidal Tails and Bridges, the Universe and the Rate of Expansion. Believe it or not, all these terms and names have one thing in common: they are related to the stellar matter within our universe for which science and technology work hand-in-hand exploring, defining, analysing and seeking to understand in order to form a basic picture of the creation of our universe. Current scientific thought on this subject is threefold: The Big Bang Theory, The Steady State Theory and The Pulsating Theory. Though beyond the scope of this section, suffice it to say that when astronomers peer into and survey the universe, what they are doing is analyzing and exploring the workings of outer space, galaxies, stars, gases, matter, planets and even the life and material which form our world called Earth. Though it may never answer all the crucial unknowns that one ponders when questioning the origins of our cosmos [fn.1], the later developmental nature of our universe is a process that science has begun to understand and in turn, this knowledge has helped us to understand our beginnings. This has come about in the same large leaps and bounds that our technology has, especially in the last twenty years and though conversely it has produced as many questions and surprises, it has also produced some very amazing results and even more amazing images. But let us backup a bit and start at the beginning. How did the first galaxies originally form? Glad you asked! The current answer is we do not know. That said, "The most popular version of the dark matter theory says that galaxies began small and grew over time through collisions and slow accumulation of material from their surroundings." from Galaxy Hunters  The Search for Cosmic Dawn [ ©1996-2009 National Geographic Society, all rights reserved ]. When the universe was very young, after the big bang, the super heated particles of matter ( mostly in the form of atoms of gas ) were scattered in the extremely violent blast, travelling in all directions at once, at super high velocity and rolling along, at first, behind the shock wave produced as a result of the event. But while the light of the shockwave continued on the material from the blast slowed and began to cool. With this material still moving about the young universe the first processes of galaxy and stellar formation began: "Some astronomers believe the universe was built with small pieces, such as gas clouds and star clusters, that merged over time to form galaxies and clusters of galaxies. Others theorize that the early universe broke first into colossal clumps that contained enough building materials to make structures on the grandest scale  great walls and sheets of millions of galaxies  that fragmented into increasingly smaller gas and clouds, ultimately resulting in individual galaxies." Today the universe continues to expand and, as clearly shown in many images, the formation of new stellar populations is in large part, an ongoing process of merging and colliding galaxies. 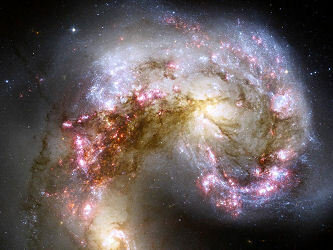 When galaxies collide the general result is that they merge into one large galaxy like NGC 2207 and IC 2163, seen at left, or they "interact" with one another, continuing on their way, reshaping their physical geometry to one extent or another due to gravitional effects, perhaps meeting again billions of years later like NGC 4676, seen at right. Recent scientific research has discovered many important facts regarding the formation of galaxies and stellar populations. Astronomers studying the Hubble Deep Field and Hubble Ultra Deep Field images saw that early galaxies were more often than not involved in frequent collisions and interactions, noting the unusual and distored shapes of galaxies seen in the images. "Earlier Hubble pictures show that nearly a third of very distant galaxies, which existed early in the history of the universe, appear to be interacting galaxies, like the Antennae. 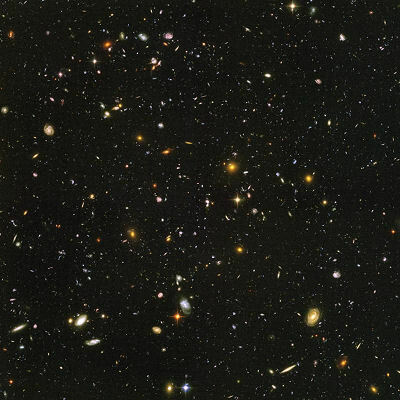 In particular, the Hubble Deep Field (a "long-exposure" image from Hubble looking at galaxies far back into time), uncovered a plethora of odd-shaped, disrupted-looking galaxies. They offer direct visual evidence that galaxy collisions were more the rule than the exception in the early days of the universe." "When galaxies collide, direct hits between stars are extremely rare, but collisions between huge gas clouds in the galaxies can trigger a stellar baby boom. The most massive of these stars race through their evolution in a few million years and explode as supernovas. Heavy elements manufactured inside these manufactured inside these stars are blown away by the explosions and enrich the surrounding gas for thousands of light years." » Clicking on the filmstrip at right will take you to the Chandra X-ray Observatory website where you can view an animation "depicting the collision of two large galaxies which now form The Antennae. Gas and stars from the galaxies are ejected into long arcs. The animation then shows how collisions between huge gas clouds in the central region of the merging system trigger a stellar baby boom." 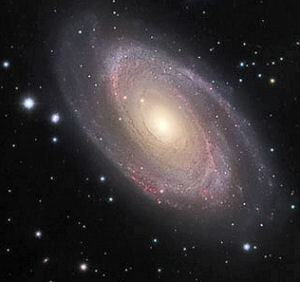 If you reviewed the astronomical data on the twelve galaxies previously imaged ( by clicking on the data box above ) you would have noticed that each galaxy has a Radial Velocity or Redshit value in the positive save one, the Andromeda Galaxy which has a negitive value of -301. Why is this important? Glad you asked! First of all, for the purposes of this section, that negitive number of -301 indicates a BLUESHIFT as opposed to a REDSHIFT of the measured light spectrum (doppler effect), meaning that the Andromeda and our Milkyway galaxies are moving towards each other! Secondly, scientists have recently revised their forcast models of when a collision with the Andromeda galaxy will occur and "just how much of the two galaxies will be involved. In both cases the revise prediction is a much sooner collision involving more of each galaxy's mass [when the two] collide with one another." But hold on and don't run for cover yet  the event is not due to occur for another 2 or 3 billion years. While we're waiting around for the collision, we can view the wonderful, high-resolution image at right by clicking on it. 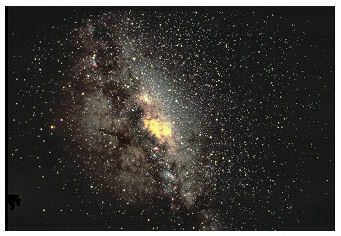 This image is a wide-angle view of our Milky Way looking towards its center. A key asterism seen in this image is the teapot of the constellation Sagittarius  "Although it is supposed to represent an archer, an asterism in the constellation looks distinctly like a teapot. Look for the handle to be on the east side and the spout to be on the west side. The brightest star in Sagittarius is the star marking the bottom right corner of the teapot, Kaus Australis. Also known as Epsilon Sagittari, this magnitude 1.79 star lies 144 light-years away." 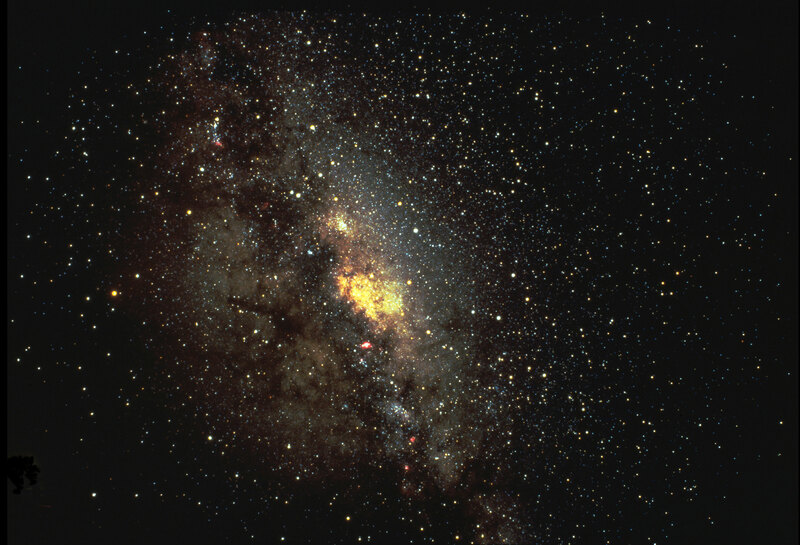 This image was taken at the Cerro Tololo Inter-American Observatory in Chili and was retrieved from the National Science Foundation website. If you took your camera into space, pointing it at the darkest most uninteresting area you could find and held the shutter open for an exposure time of over 270 hours, know what you would you get? Easy, the Hubble Ultra Deep Field image at right. "The snapshot includes galaxies of various ages, sizes, shapes, and colors. The smallest, reddest galaxies, about 100, may be among the most distant known, existing when the universe was just 800 million years old. The nearest galaxies - the larger, brighter, well-defined spirals and ellipticals - thrived about 1 billion years ago, when the cosmos was 13 billion years old...[i]n ground-based photographs, the patch of sky in which the galaxies reside (just one-tenth the diameter of the full Moon) is largely empty. 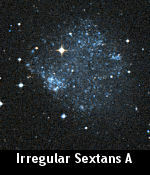 Located in the constellation Fornax, the region is so empty that only a handful of stars within the Milky Way galaxy can be seen...[t]he image required 800 exposures taken over the course of 400 Hubble orbits around Earth. The total amount of exposure time was 11.3 days, taken between Sept. 24, 2003 and Jan. 16, 2004." For a zoomable version of this image click here. « Clicking the filmstrip at right will take you to the HubbleSite video page where you can view a variety of movies which pan selected areas of the HUDF. You can also watch interviews with the principal astronomers whom were responsible for the different phases of Hubble's ultra deep infrared survey. The HUDF project is the third relevent survey of this type conducted in the last 15 years, the others were the 1995 HDF-North and the 1998 HDF-South. The images that Hubble produced where and are a milestone in terms of evolutionary astronomy; the HUDF is the closest we have come to viewing what our universe looked liked when it was only 5 percent of its present age, shortly after the event known as the Big Bang. 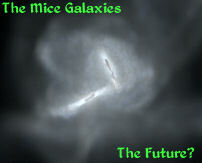 3-d animation of the Mice Galaxies and possible future collision, Joshua E. Barnes et.al. The image at right is from Joshua E. Barnes & John E. Hibbard's site Sneaking Up On The Mice (NGC 4676) where "The numerical models presented here show how two ordinary galaxies can be transformed into a dramatic interacting system." Their goal was "...to find a plausible model matching the morphology and VLA observations..." Graduate student Lisa Chien and Joshua E. Barnes have created what looks to be "...the most realistic renditions of N-body simulations now in existence." 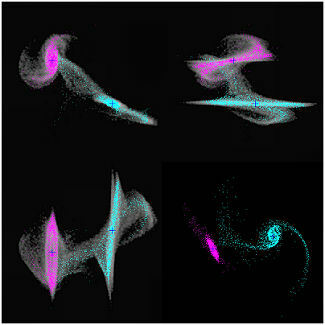 The simulation models the collision of the Mice Galaxies along with the image at left, a simulation of what may eventually become of the two galaxies as they collide and merge. "Models including star formation can be combined with the output of a stellar population synthesis code to produce realistic images in standard photometric wavebands." Computer modelling has come a long way in recent years, benefitting greatly from a wave of new scientific data as well as the trend resulting in the increase of computer technologies. Modeling simulations of galaxies, their interactions and collisions have given astronomers a way of verifying their theories and predictions. But most important of all, a computer simulation can accomplish what we, as humans are unable to do  study the evolution of a single galaxy as it changes over billions of years. "By combining test-particle and self-consistent techniques, we have developed a method to rapidly explore the parameter space of galactic encounters. Our method, implemented in an interactive graphics program. This software is available at http://www.ifa.hawaii.edu/faculty/barnes/research/identikit/, can be used to find the parameters required to reproduce the observed morphology and kinematics of interacting disk galaxies." ( Joshua E. Barnes et al 2009 )  Image description: Identikit model (points) matching a self-consistent N-body simulation of a galactic collision (grey scale). Each panel shows a different projection: top left shows sky-plane (X,Y), top right shows velocity-position (V, Y); bottom left shows position-velocity (X, V), bottom right shows (X, Z). « Clicking the filmstrip at left will take you to Joshua E. Barnes & John E. Hibbard's website where you can view their computer simulations on the formation and interactions of NGC 4676 ( the Mice Galaxies ). Particularly noteworthy is the section entitled "Photorealistic Images" which simulates the Mice galaxy prior to, during and what may eventually be in store for these two as they collide. 1  The term "cosmos", as used herein, refers to our universe regarded as an orderly, harmonious whole. In addition to the numerous links that appear on the pages of this website, there is also a wealth of astronomical data from all psossible sources across the world wide web and this list of sources is quite extensive. As such, the bibliography appears at the end of each section. For those wishing a complete listing for the entire topic under discussion, such a file will be made available after the completion and posting of the entire section. Some of the websites that are regularly used herein I would like to recognize and thank, especially the individuals therein who make possible the material that is available to everyone, everwhere in the pursuit of knowledge: NASA/IPAC Extragalactic Database ( NED ) which is operated by the Jet Propulsion Laboratory, California Institute of Technology, under contract with NASA, the Simbad Data Query & Aladin Sky Atlas websites, the HEASARC Data Archive, the Astronomy Picture of the Day website, the ESO, the Spitzer Space Telescope website, the Chandra X-Ray Observatory website, the Sloan Digital Sky Survey website, the Anglo-Australian Observatory website, the European homepage for the NASA/ESA Hubble Space Telescope, the Pulkova Observatory Saint Petersburg Russia website, the Astronomical Journal website and the NASA/JPL website. IDENTIKIT 1: A MODELING TOOL FOR INTERACTING DISK GALAXIES Joshua E. Barnes et al 2009 The Astronomical Journal 137 3071-3090, Published 2009, January 13. Linked file is in .pdf format. Galaxy Dynamics Computer Simulation "The paper considers a mathematical model of the behavior of an assembly of N stars. " Dmitry Abrosimov, Mon 14th Apr 2003. From the ©1997-2009 OSNews LLC. website. Page Designed by Ken Pinkela -- .css Template Modified by Doreen "brite_star" L.